A surreal and larger than life outdoor performance tells the story of a girl through movement and dance. Hiding in a tree house, she cries herself to sleep and dreams the sounds of her garden, which turn into music. She dreams of two old giant butterflies dancing a dance of love. The male catches the pregnant female’s eggs and hangs them on a leaf where they hatch and grow into giant caterpillars. A hungry black crow is hunting and the haunted girl wakes up inside her dream to challenge the predator and protect the miracle of life. 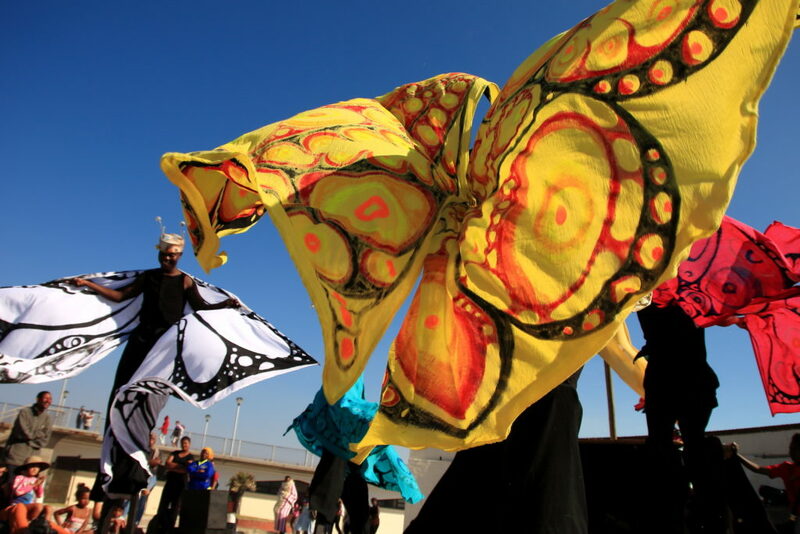 Butterfly Dreams aka Metamorphosis brings together elements of street theatre including stilt walking, dance, music and audience participation. The story follows the journey a butterfly from egg, through larva and pupa to caterpillar and broaches big transformation in our own lives. Butterfly Dreams is 45 minutes in duration and is fun for the whole family. Butterfly Dreams is the creation of Jungle Theatre Company’s Laduma Jungle team and was developed as the final part of a National Lottery Distribution Trust Fund funded trained programme. It was directed by Vincent Meyburgh with set and costume design by Monique Fagan of Junkanew. Through the actors’ involvement in choreography, writing, composing, designing and making, Butterfly Dreams fosters a closer link between the actors’ experience, characters’ stories, the music and creation of images. The production was performed as community event at the start of the school holidays in December 2011. It was partly commissioned for the KKNK in 2012 and was staged at a number of festivals during 2012 i.e. Khayelitsha Cocktale Festival, International Kite Festival, Harfield Village Carnival and Hout Bay Green Faire. With funding received from the National Arts Council and Department of Cultural Affairs and Sport the show was recently re-developed during 2015 and performed in Muizenberg early December 2015 and the Company Gardens in March 2016. During February 2017 Butterfly Dreams was performed as part of JTC’s Our Beaches Our Stories project which brought public art performances to public recreational spaces i.e. Monwabisi, Strandfontein and Muizenberg Pavilions, promoting natural and cultural heritage. Kelly Spilhaus; Siyawandisa Badi; Joce Engelbrecht; Athenkosi Dyantyi; Ntombifuthi Mkhasibe; Vincent Meyburgh and Seiso Qhola.